Components of nonsense-mediated decay (NMD) and the exon-junction complex (EJC) are engaged by hepatitis C virus and the related flaviviruses West Nile virus (WNV), dengue virus (DENV) and zika virus (ZIKV) during infection. However, depletion of core components of these pathways demonstrates distinct roles in viral infection. When starting my new lab at the University of Pennsylvania, I was particularly excited to apply the techniques I developed in my postdoctoral work with hepatitis c virus (HCV) to a related group of emerging and re-emerging pathogens of the flavivirus genus, including West Nile virus (WNV), dengue virus (DENV) and zika virus (ZIKV). We set out using affinity purification and mass spectrometry to identify host proteins that are physically engaged by these viruses to illuminate the host processes that are manipulated during infection. Our protein-protein interaction map revealed a number of interesting connections, including a subset that were previously identified in our HCV-host protein-protein interactome. Among these was PYM1, a host protein with a number of roles in RNA biology, including the exon-junction complex (EJC) and nonsense-mediated decay (NMD). This validated our previous work that demonstrated that PYM1 interacted with HCV core (capsid) and the capsids of the related flaviviruses WNV and DENV, further extending these studies to ZIKV capsid. We previously found that HCV infection attenuates nonsense-mediated decay, and this was also the case for the flaviviruses WNV, DENV and ZIKV. PYM1 is known to interact with the EJC proteins MAGOH and RBM8A; we previously found that HCV infection and capsid binding to PYM1 disrupts this interaction. We assessed whether WNV capsid binding to PYM1 similarly impacts interactions with the EJC and found that, indeed, this was the case. Furthermore, we performed cellular fractionation experiments and found the EJC proteins are mislocalized during viral infection, accumulating in a membrane/organelle compartment that we hope to define in ongoing work. These data all suggested that the viral protein interactions with PYM1 were impacting HCV and the flaviviruses similarly. However, we were surprised by our genetic studies. While depletion of PYM1 reduces HCV infection, this treatment led to an increase in WNV, DENV and ZIKV replication. This led us to test if NMD itself was antiviral during WNV, DENV or ZIKV infection and found that it was: depletion of the core NMD factor UPF1 lead to increased infection. Again, this was distinct from HCV infection, which was not altered upon UPF1 depletion. Since NMD was antiviral, this led us to the simple hypothesis that NMD targeted viral RNA for decay. In support of this, we found that the NMD-related EJC protein RBM8A binds to WNV RNA to direct NMD-mediated degradation. 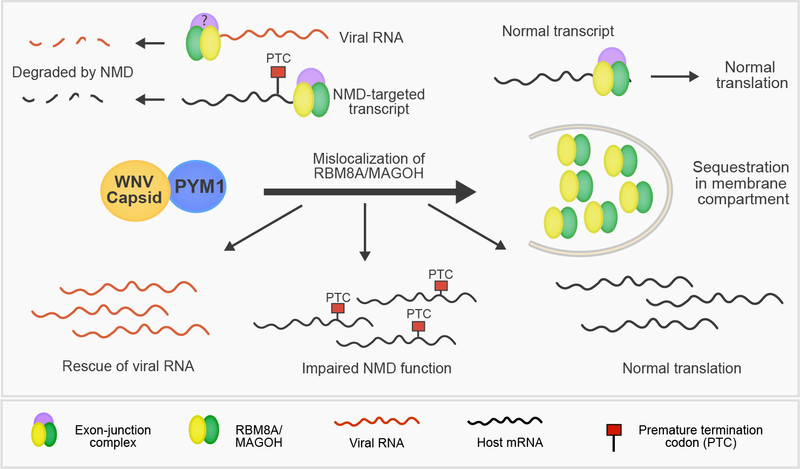 Moreover, the interaction between WNV RNA and RBM8A is diminished upon depletion of PYM1, suggesting that PYM1 is required for the association between the EJC and viral RNA. Together, these data support a model in which NMD targets viral RNA through an interaction with the EJC protein RBM8A and that WNV subverts this response through the interaction of WNV capsid with PYM1 (Figure 1). Figure 1. In WNV-infected cells, RBM8A (and possibly other EJC components) interact with WNV RNA, targeting viral RNA for degradation by the NMD machinery. This is subverted by West Nile virus capsid binding to PYM1, relocalizing RBM8A/MAGOH from the viral RNA into a membrane compartment. This results in reduced interaction of RBM8A/MAGOH to NMD-targeted host mRNAs and viral RNA, rescuing both from degradation by the NMD machinery. Interestingly, studies have shown that haploinsufficiency of the EJC proteins MAGOH, EIF4A3, or RBM8A present with neurological defects. Given the connections between neurological defects in developing fetuses and neurotropic flavivirus infections, future studies to determine the role of these proteins in the development of virus-induced neuronal abnormalities may be informative.